Color-coordinated vinyl bumper tops to help protect furniture. Raised 1" bottom may ghelp prevent heat transfer to floor. 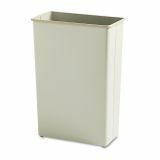 Safco Rectangular Wastebasket, Steel, 22gal, Sand - With an 88 quart capacity, this large rectangular wastebasket is excellent for use in common areas to help collect trash. 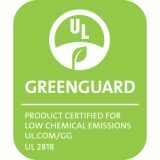 Use in your conference rooms, auditorium, lobby, entranceway, print station, lounge area, break area, mailroom, ware house, classroom or even a trade show. Puncture-resistant, fire-safe, heavy-duty steel construction will not burn, melt or emit toxic fumes. Bottom is raised 1 to provide air cushion insulation in the event of fire. Steel has a powder-coat finish. Color-coordinated vinyl bumper tops and no-mar polyethylene feet protect furniture and floors. Wastebasket meets all OSHA requirements for waste receptacles and qualifies under NFPA Life Safety Code 101, Section 31.